Yes, I am going there. One of the most hotly debated questions in prepper/survival/firearm enthusiast circles is around the best survival rifle. For all intents and purposes, there are only two in competition in the US and those are the AK-47 and the AR-15. I will add that there are variants of both and I am lumping all of those into these two categories. 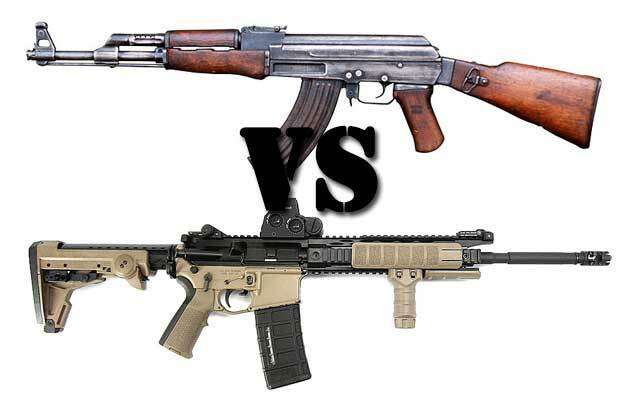 This question of what is the best survival rifle is one that I asked myself when I was considering my first rifle purchase so I wanted to take some time on the Prepper Journal blog today to hash out what I see are the differences and to give you my opinion as to which rifle is better when it comes to the AK-47 vs AR-15. No idea which assault gun is better. Don’t they say it’s not the gun, it’s who is using it? Thanks for visiting my writing website and reacting to Winter of the Best Snow. I see you have a blog re a Southerner’s response to Northern criticisms re snowy weather, so I’ll read it when I finish my comment. I also got distracted by your reblog of signs that your girlfriend is a psycho. I left a message with the author I could have used that information a couple of decades ago. More snow/ice forecast for tomorrow (March 16), but not for the foothills of NC, unfortunately. Keep the light on when you read it. What part of NC? Hmmm, lights on? Maybe I should save this read for the trail? Or maybe for my first trip to the Amazon Rain Forest next month 😉 I’m from Welcome, NC. Lived 39 years of my life in that wonderful little town, swearing that I’d NEVER leave it. Met the man of dreams (on FB) married him and moved to Northern Alabama almost 3 years ago and I’ve never looked back. Though I do go visit my home town and family often. I believe I saw you reference High Point , NC in a recent post of yours? That leads me to “assume” that you just might know where Welcome is located 🙂 Most folks have never heard of it. Sure do. Grew up in High Point. Watch out for the Anaconda!